So, last night I was pretty deep in the pit of despair. So stressed out, that I was nauseous. What do I do about it? Instead of sleeping, I stayed up and reworked the design for my blog. I actually think it looks fairly decent, now. I do love WordPress and how simple it can be to just change out the look and feel of your site with a theme refresh. Want a custom WordPress theme for your site? I offer such services for a reasonable price. Just ask! 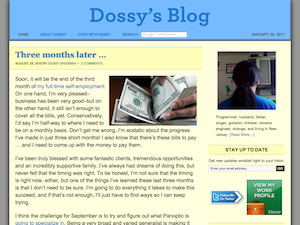 I like your new theme and have enjoying reading through your blog. Can’t believe this is the first time I’ve been here, but you’ve done a nice job here. Good luck with work and I wish you much success. Um . . .how do you expect to be cool with no Comic Sans in sight? ;p V. nice layout as usual!